Bryan noticed that changing a single value in the Pocket Gal Deluxe decryption (related to the address scrambling) revealed some clear text in Diet Go Go. THis means that the encryption key is almost hardcoded as I expected, but with some minor variation (maybe externally to the DE102 iself). I have isolated the variations in just two numbers, a 16-bit one for the address scrambling and an 8-bit one (or two 4-bit ones) for the data bits permutation and xor. Fine tuning the values to correctly decrypt data in Diet Go Go was easy enough. Double Wings required a little more works, but it was still easy. I just needed to brute force the 16-bit parameter. Doing that was easy because I just had to decrypt the ROM using each possible value for the parameter, and count how many zeros were in the decrypted data. When their number rised from a couple of thousands to tens of thousand, I had a "good enough" value for the parameter, which I could later tweak by hand. So, data was decrypted in all four games (the other one is Boogie Wings which decrypted with the same parameters as Pocket Gal Deluxe), but opcodes were still encrypted. However, most of the work was already done. Even if the opcodes are encrypted differently from data, the address scrambling must of course be the same, otherwise there wouldn't be a 1:1 correlation between logical address and physical address. Therefore, only the data bits permutation and xor changes. The obvious candidate for that variation was the 8-bit parameter. A brute force search was even easier in this case. I just had to try all possible values and count how many times 4E75 (the opcode for RTS) appeared. When it increased from a couple of times to several hundreds, I had the key. So all four known games using this CPU (Pocket Gal Deluxe, Diet Go Go, Double Wings and Boogie Wings) should now be fully decrypted. Non of them is working; for that, the driver will have to be finished, and possibly some more protection worked around. But the first hurdle has been overcome. The recent discovery of a decrypted bootleg of Pocket Gal Deluxe was a pleasant surprise. This is one of a handful of games that use the same encrypted custom CPU - called DE102. It is now confirmed that the CPU is a 68000. Address scrambling. When the CPU wants to read a word from logical address N, it fetches it from ROM space at address N'. The scrambling of the address requires 16 conditional XORs with 16-bit values. Data bits permutation. After reading the word from ROM, the order of its bits is altered. There are 16 possible permutations; which one to use depends trivially on the logical address. Data XOR. After changing the bit order, the value is XORed with one of 16 other values. Which one to use depends trivially on the logical address. While working on Pcket Gal Deluxe, I was hoping that the DE102 would use a fixed key, which would have emant free decryption of a few other games. Unfortunately, this turned out to not be the case. The algorithm surely is the same, but the key is different. Determining the key without having a decrypted version to compare with is a lot more difficult, as you can imagine. Also, it seems that at least one of the other games encrypts data and opcodes differently, which makes things a lot more complicated. In the next days, I'll see if I can find a way to break the key somehow. 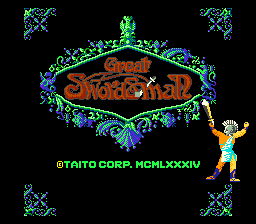 Sprite colors in Great Swordsman have been one of the longest standing and most elusive emulation imperfections to date. It was hardly noticeable, because a manually crafted lookup table had been crafted in the driver, so colors looked ok. Finally, thanks to Kold666's invaluable help, the emulation is now perfect. As you can see in the shots, the difference is subtle but it's there. It is probably most evident on the pulsing logo, whose color changes are now slightly smoother. The way how I achieved this is worth of mention. Kold kindly provided some pictures of the pcb (parts side and solder side). I x-flipped the solder side, overlapped them in a gfx editing program, and carefully aligned them so I could see both layers at once. Then started tracing from the color lookup PROM, to see what the board does with the data. In the end, it turned out that the sprite palette data comes from a row of the character palette, the tricky part being that the order of the 4 bits coming out from the lookup PROM is reversed. This is something that could have been noticed before, but it always eluded me. I didn't have much time for MAME in the past few weeks, but tonight I could finally do something again. This time I decrypted the graphics for Panic Road. The encryption is just a simple data and address lines swap, so it wasn't particularly hard to do - but it took some time nevertheless. I don't have time to finish the driver, this will be a job for someone else.